I usually use my kitchen for cooking and have sometimes written about parallels between my cooking and arts participation. 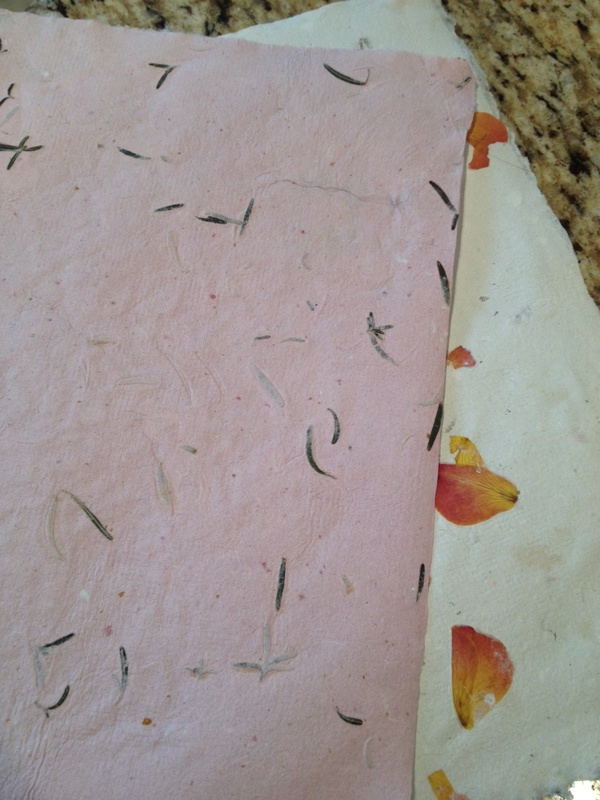 Recently I’ve started to use my kitchen to experiment with the craft of papermaking. This started on a whim when I received a letter from a friend written on some beautiful handmade paper from Nepal. My paper will probably never attain the delicacy and beauty of the paper I received, but through trial and error I’m making progress. My first experiments taught me that the quantity, color, and quality of the material I put into the pulp will directly effect the outcome. Too much newspaper led to uninteresting gray-green cardboard, almost too heavy to fold up into an envelope. A later experiment taught me that technique matters: the overzealous use of a rolling pin caused the paper to break apart as it dried. I’ve started to collect materials, papers, leaves, flowers, that can go into my trials. Today’s experiment taught me that the paper will pick up any texture, intended or not, that it comes in contact with while drying. Finally, though, I managed to create a delicate piece of paper of relatively uniform thickness, a mottled pink color, and the lovely scent of rosemary from the leaves added to the pulp at the last minute. The papers have been or will be sent to people close to me, the friendliest of audiences who will honestly critique my craft while still appreciating and loving the gift of it. Artists need my kitchen, metaphorically speaking. Really, they need their own – a place for trial and error, for experimentation, innovation, a place where they can collect materials and store them for later use, a place where they can share their work in progress with honest but receptive critics. There are, of course, artists lucky enough to have such a creative home, but for many – if not most – that experimental infrastructure does not exist, especially after the artist completes her education. How much creativity is thwarted by the want of a kitchen? This entry was posted in arts infrastructure and tagged cooking, craft, infrastructure, Papermaking. Bookmark the permalink.